It’s the best day of the month! Only this month we’ll have a few more best days with our fun Labor Day Triple Hop this weekend, woohoo! You should have arrived here from Felicia’s blog Be sure to start at the beginning, and comment on every post in the hop for a chance to win $10 to the shop! I’ll include the line-up later in case you missed some. 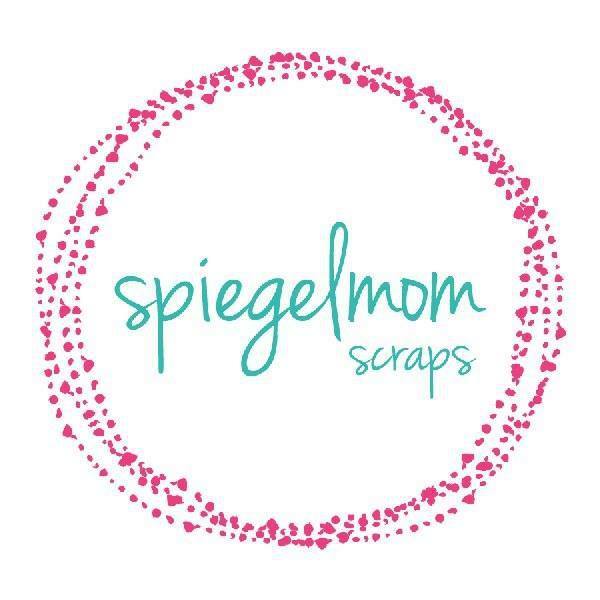 The SpiegelMom Scraps shop has a boatload of new goodies featured in the hop today, some of which I included in today’s layout. I started with background paper from Amy Tangerine’s Oh Happy Life collection. I smudged it up a little with some black ink and stamping, then layered a few paper scraps from Dear Lizzy’s Saturday collection and Crate Paper’s Cute Girl line. Check out that scribbly circle cut file included in this month’s exclusive cut file set! I think it’s perfect for adding dimension because it’s delicate and can be layered over stuff without being too overpowering. I added a few embellishments from my stash along with the gorgeous new gray heart felties from the shop! I absolutely love how they look stitched onto my project. They come in several sizes and are perfect for adding interest. I also love balancing with things that are similar but different sizes. I’m loving the color combo of that mix! Here’s the line-up in case you missed anything! Be sure to comment on all the posts, you only have 1 day this time so don’t miss out. And don’t forget to grab the exclusive cut file set, here. Thanks for stopping by! LOVE! The scribbly circle is my favorite too, but these fall colored feltie hearts are wonderful too! Great page! Thanks so much! They are great, aren’t they?! Great layout! Love the stitching and layers! !